There is no national registration of companies in the USA. All businesses are registered at the county or state level. Listed below is how to register in Ohio. The state or counties will not check (or care) if your name conflicts with names of other businesses in other states! Sole Proprietorships and private partnerships are registered at the County level in Oho. This includes Fictitious Business Name statements (also known as “DBA”s). In most cases the fee is under $50 and anyone can register a business simply by visiting your county’s business office and completing the right paperwork. 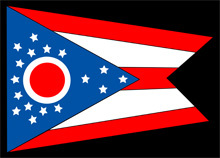 Trademarks: Ohio does have its own trademarks and service marks. These provide you no protection outside the state, so we strongly recommend proper federal trademark filings with the US Patent and Trademark office. Sales Tax: In Ohio retail sales tax is the same in all counties. Clothing and food for home consumption are not taxed in Minnesota. If you will be selling taxable good or services (which is often the case unless you only sell to resellers), you will need a tax id from the Illinois Department of Revenue. Largest Cities: Cleveland, Columbus, Dayton, Cincinatti, Akron, Toledo, Mansfield, Zanesville, Youngstown, Upper Arlington, Springfield, Reynoldsburg, Middletown, Lorain, Kettering, Hamilton, etc. 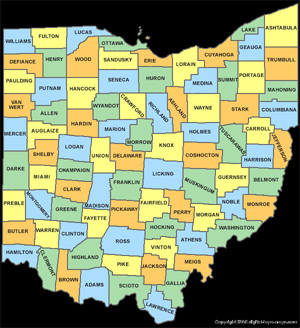 Brighter Naming has done extensive creative and process naming work and trademark checking for clients throughout Ohio, including all the major area codes which are 216, 234, 330, 419, 440, 513, 567, 614, 740, 937. The name “Ohio” originated from Iroquois word ohi-yo’, meaning “great river” or “large creek”. Although there are conflicting narratives regarding the origin of the nickname, Ohio is historically known as the “Buckeye State” (relating to the Ohio buckeye tree) and Ohioans are also known as “Buckeyes”.